This week has given me two new toys to play with, and you could probably say both were bought at the dollar store. The first was Microsoft‘s release of Rebranded Live, aka Bing. Bing’s search results have been poor (for me), but not much poorer than Google‘s. Just enough poorer for me to see no reason to really switch, which is very bad for Microsoft. There are neat little features, like pop up feed links for blog posts and previews. I like it, but it’s not much. Where they shine is in image search, which incorporates similar image search already (Google still has theirs in Labs). Google Similar Images knocked my socks off at first, but then it just seemed like it should be renamed Google Identical Images. Not much diversity. Bing got this part right. The images are similar, not identical. There is a diverse collection and the navigation is great. Kudos, Live Labs, for that one. Is it perfect? Nope, but it’s better than what I was using. Google Squared. You had me at hello. Further playing around with it convinced me that this would have been a nice tool to have when I was doing ridiculous term papers in high school. Term papers about crap I didn’t care about. Basically random stuff. G^2 is great for that, but really not very helpful otherwise. It was pretty awesome finding out the number of victims of 30 different serial killers all at once, though. As quality improves (assuming it does), this could be pretty useful. Quality has to get there though. 90% of time using it is trial and error trying to find something that works. I was able to add some sorting algorithms to a square, but couldn’t find a single column to add that actually had something in it (that wasn’t absurd). 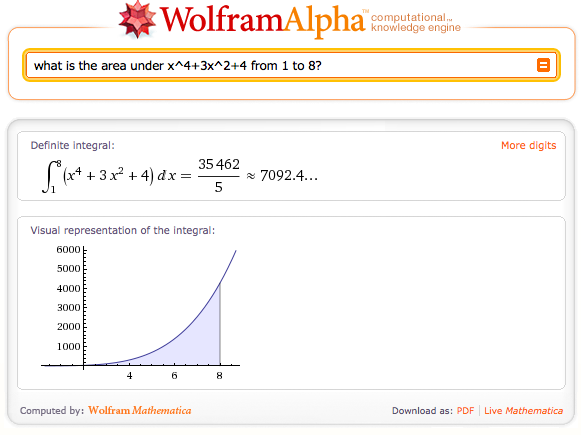 Wolfram|Alpha is still the winner in the knowledge engine department, methinks. Perhaps you’ve heard of the latest brainchild of the Wunderkind Stephen Wolfram: Wolfram|Alpha. Matthew Hurst nicknamed it Alphram today and I agree that’s a much better name. Wolfram|Alpha (W|A henceforth) is not a search engine, it’s a knowledge engine. It will compete with Google on a slice of traffic that Google really isn’t all that hot in for now, comparative questioning answering. When you ask Google something like “How does the GDP of South Africa compare to China?” you hope you get back something relevant in the first few results (spoiler alert: you don’t). When you ask that of W|A, you get exactly what you’re looking for. Beautiful. W|A’s so-called natural language interface isn’t perfect, though. You get a lot of flakiness from it until you start to recognize what works and what doesn’t. Now let’s be honest. How often do we search for that kind of thing? Not very often. I think that’s partly because Google is notoriously bad at it. Once we start to get a handle on what W|A is capable of, I think people will start expecting more of their friendly neighborhood search giant. Google claims to have a few tricks up its sleeves, but everything I’ve seen out of Google lately has been such a disappointment I am deeply skeptical. The new trick is called Google Squared and it returns search results in a spreadsheet format, breaking down the various facets of the things you are searching for. In the demo, it shows stuff like rollercoaster drop speeds, heights, etc when you search for roller coasters. You can add to the square and do some pretty nifty stuff. TechCrunch claims this will kill W|A. I think the two could be complementary. Based on the demo, I expect W|A will return results of a higher calibre, but will miss out on a lot of queries because the knowledge is just missing. Google Squared appears to be doing something fuzzier and will return results that might be really bad. 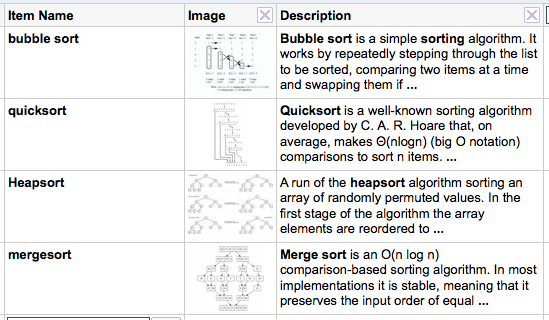 So while W|A just says it doesn’t know, Google Squared will let you pick through the junk to find the gem. Google Squared is expected to launch later this month in Google Labs. Many have said that where W|A will really compete is against Wikipedia and I am inclined to agree. There are plenty of things I go to Wikipedia for now that I probably will switch over to W|A for, like populations of countries, size of Neptune’s moons, and so on. Wikipedia still wins for more in-depth knowledge on a topic. W|A also does some pretty cool stuff when you search for the definition of a word (use a query like “word kitten“). You learn that kitten comes from Classical Latin, and entered English about 700 years ago. You can find out a similar thing (and go further in depth for the etymology at least) using the American Heritage dictionary on dictionary.com, but W|A requires less digging. And this brings me around to a key point with W|A. It’s an awesome factoid answering service. It does it well and it does it in a pretty way. Stuff you can find in more depth elsewhere you can get quickly and easily, but only superficially via W|A. There are links to more information, though, so you don’t lose much by relying on W|A — assuming it has knowledge about what you’re looking for. You’re still going to be more likely to hit a brick wall with W|A. And of course, since Wolfram developed Mathematica, W|A is backed by it. Enter an equation and you get some really handy math info back. Need to quickly know the derivative of a fairly complicated equation? Presto. Probably the most satisfying feeling I got today was from a query similar to “what is the area under x^4+3x^2+4 from 1 to 8?” Let’s see you answer that, Google Squared. There has been much ballyhoo in the blogosphere touting Google’s so-called foray into semantic search. The blog post announcing the new feature doesn’t even mention the word semantics, but it does say it looks at associations and concepts related to your query. I see no mention of tuples or anything of the sort and the suggested queries are the kind of thing that I would expect to come out of a background closer to document/query classification than semantic analysis. And the results are pretty meh. Except for taming of the shrew, those results are no-brainers. That’s query completion quality results. Of course you can’t judge the whole system by one isolated example. When PC World and a host of other pop tech media zines started toasting the entrance of Google to the semantic arena, I was excited to see some cool stuff. Imagine my disappointment when I was not only underwhelmed by the quality of the results, but by the lack of novelty. How long has that feature been there? Seems like I’ve seen it for ages. Maybe it got a technological face-lift (I guess that would be a face-lift on the inside), but it looks about the same as I remember it. Plus, its placement at the bottom of results page relegates it to search engine hell. In summary: boring. My complaints are first and foremost with those elements of the blagoblag who over-hyped this. Secondly, I am complaining to Google for not being better. I am feeling demanding today. Daniel’s post on it is worth reading. It is bad journalism when an old news story is debunked and continues to be rehashed! How sloppy! Shame on you, Houston Chronicle! Back around 2000, when Palem began thinking about the future of computer chip technology, power consumption wasn’t a big consideration. Only speed mattered. But today, the energy consumed by information technology – a January news story likened the energy used in just two Google searches to boiling a kettle of tea – has become a major consideration. Google debunked the results quite quickly after that article ran. Why is it acceptable to cite stories without checking on whether those stories are accurate? Isn’t this what we pay journalists for? I guess it’s too hard to check up on facts and instead we can just say there was a news story that reported it rather than making any claims about its correctness. Isn’t that what we have bloggers for? These are the gmail ads presented to me upon receiving an email with the subject “Nazi Israel.” The text of the email contained no mention of Germany. If wishes were horses, we would all ride. If wishes were fishes, we would all cast nests. We spent the day in a fairly hot conference room hacking away on a variety of projects. We set up teams beforehand to work on projects that people proposed and I chose to work on a variation of a computing puzzles site, dubbed LangWar. The idea is fairly simple in the early stages: people submit programming puzzles and other people post their solutions in code form. You can vote which questions you like and which answers you like (or dislike). You can also leave comments on questions and answers. The result of the ratings is that the best questions will be counted higher, in a method similar to Reddit, and the best answers will trickle to the top based on the votes of users. This is very similar to Stack Overflow, but different in that it is intended to be more of a puzzle solving site that pits implementations in different programming languages against each other. It’s sort of a battle royale of programming languages – thus the name, LangWar. It’s more of an enhanced version of Project Euler, where people can vote on the questions and answers. In any case, it was a great chance to get my hands dirty in Google App Engine, meet some Atlanta python coders, and have fun. It’ll be interesting to see where LangWar goes from here, if it does go anywhere.